The colour is ruby red with a slight tendency to garnet. The perfume is intense and complex, with dominant notes of Amarena cherry. The olfactory phase continues on the palate. The flavour is full, harmonious and persistent, with dense and silky tannins. 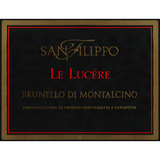 The 2011 Brunello di Montalcino Le Lucere emerges from the estate's oldest vines. Here the balance of fruit and tannin is much more successful. Sensual and layered in the glass, the Lucere offers good up-front richness to match its creamy, inviting personality. Generous black cherry, plum, smoke, spice and menthol flesh out on a resonant finish laced with attractive aromatic overtones. In this vintage, the oak and tannins are very nicely balanced, something that hasn't always been the case here. At times, the ripeness of the vintage is a bit dominant, but this is a gorgeous wine from San Filippo. A firm, silky wine with blueberry, dried mushroom and wet earth. Full-bodied, firm and silky. Long, delicious finish. Some orange peel too. Tight. Needs a year or two to soften.